If you want to buy some electronics or information technology equipment as souvenir, Akihabara is a must. There are about 500 electronics stores in Akihabara. Akihabara is only two minutes away from Tokyo station by train. You can find electrical products which match your voltages and frequencies. Mirrors, swords, and jewels have been considered to be the “three sacred treasures” since ancient times. They are regarded as symbol of wealth. Japan enjoyed a period of prosperity from 1955 to 1965, and the television set, the refrigerator, and washing machine were nicknamed the “three sacred treasures.” The number of electronics shops rapidly increased in Akihabara. Young people began to come to Akihabara in the 1980’s when Nintendo began selling video game consoles and they became popular. Akihabara has also been gaining popularity as a computer town since Windows 95 appeared on the market. If you want to understand modern Japanese culture, you should walk through and look at the goods sold in Akihabara. It’s also fun to do people watching there. Akihabara is the slow window of Japanese subculture. Akihabara has also become a magnet for “otaku,” a word which roughly means “geeks,” especially for comic enthusiasts. 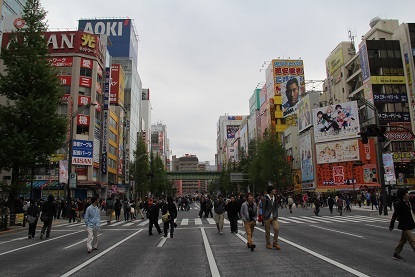 Akihabara is crowded with a variety of attractions on weekends. “Cosplay” is very popular now. “Cosplay” is Japanese English. This word is a combination of “Costume” and “Role-play.” Some young people enjoy dressing up and playing the parts of famous characters, not only from comics but also movies and novels. They probably want to show the hidden sides of their characters to others. The same thing can be said about “maid cafes.” There are also several “maid cafes” where waitresses dress up like real domestic maids. They treat their customers very politely and behave like real maids. The customers fell like the lords of huge mansions. This is another expression of the new subculture.